Archaeologists excavating in Peterborough are delighted to have discovered a hole. Project Co-ordinator Professor Christian Pyle announced that this remarkable find was the result of six months of painstaking work. "For a while," he says, "it looked as though this site was going to produce nothing at all. It was really rather disappointing. There were no traces of foundations, no coins, no primitive jewellery, nothing. "We were all ready to pack our bags and head for home when one of the team suddenly took a step back and realised that what we had actually found was this remarkably well-defined hole." 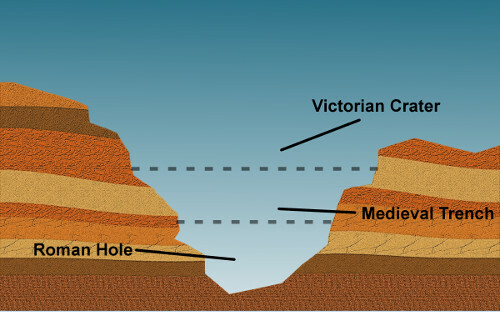 The hole measures four foot by six, and is at least seven feet deep. Professor Pyle believes that further excavations could reveal it to be much deeper. Opinion is divided as to the origins of the hole. With no other finds, there is little dating evidence, although the consensus seems to be in favour of it being Roman. "It really is an incredibly well-preserved feature, and further studies are bound to cast more light on how people lived in Roman times," says Pyle. "Especially those people who lived in holes. And to think, had we not persevered in our excavation, this hole may never have seen the light of day. "It just makes you wonder what other remarkable cavities are out there, just waiting to be unearthed - in parks, on wasteland, even in your back garden. Who knows, you could go out tomorrow morning, spend and hour or two attacking your daffodils with a spade, and discover that you've got a hole of your very own. Now, wouldn't that be nice?"